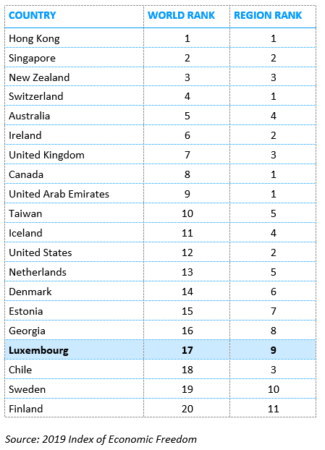 Luxembourg is ranked 9th among 44 European countries in the 25th edition of the Index of Economic Freedom published by the Heritage Foundation. Its overall score is above the regional and world averages. The index defines an economically free society as one where “individuals are free to work, produce, consume, and invest in any way they please. In economically free societies, governments allow labor, capital, and goods to move freely, and refrain from coercion or constraint of liberty beyond the extent necessary to protect and maintain liberty itself”. According to the study, economic competitiveness is sustained in Luxembourg by an open market system with solid institutional foundations. The legal system is independent and free from corruption. It protects property rights and upholds the rule of law. Entrepreneurial activity is encouraged by high levels of regulatory transparency and efficiency. “Market openness”: trade freedom (86,0), investment freedom (95,0), financial freedom (80,0).